I realize I've already posted once today, but I didn't want to wait any longer to share this with you. Laurah, from The ESOL Odyssey, is putting together an amazing event to help teachers who were affected by Hurricane Sandy. Imagine if all the materials you spent years and probably much of your own money collecting were suddenly gone. Hopefully by joining together, we can make a difference for many of the teachers in that situation. We can't replace their homes, their clothes, their cars....but we can help take the burden of what to do with their students off their shoulders once school resumes. 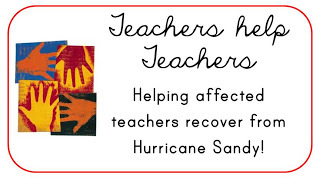 If you are a teacher who has been affected by Hurricane Sandy, make sure you head over to The ESOL Odyssey to fill out a form to request materials for your grade and content. Look for this button when you get there. If you are a blogger who is interested in lending a helping hand, look for this link on Laura's blog. Let's pull together and help fellow teachers in a time of need. You'll see there are over 60 bloggers signed up already, but there is still a great void to fill. Thanks for posting this. I've joined in. You're welcome! Glad you can lend a hand, too. This is a beautiful thing. Thank you for posting it. I can't imagine what it would be like to go through a situation like that.